In today’s age and time, the computer network has evolve into a system that has integrated every available devices capable of plugging itself therefore becoming part of the bigger collection of computer devices that has been connected. But before we proceed let go back to the basic of computer network. What is computer network? Better yet what is the proper term to describe a computer network. There are three correct and right term to describe a computer network. Yup there are three, this is because the location or land area where the network is very important in describing the kinds of network. For a computer network located on a single building big or small, it doesn’t matter how many floor’s are there as long as it is in one building then it can be classified as a LAN or Local Area Network. Now the word LOCAL is pretty straight forward you already know what it means. Before we go into the other two types of network we will focus on this network the LAN. What basically is a LAN, as the name implies it is a network located on a small area typically a building whether large or small but one single building only. Remember scope of the location for a LAN is one single building only. If there are two or more building then it is no longer a LAN but the next type of network called a MAN or Metropolitan Area Network. But let’s focus on the LAN. What are the components of a LAN? The basic components of a typical LAN are the workstation, server and network component such as HUB, SWITCH and ROUTER. 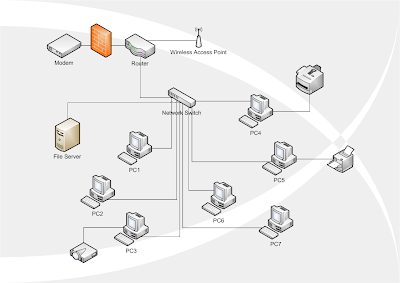 This is the BASIC components, which mean there are other computers of a more highly developed LAN. But the first two basic component of a LAN is the workstation and the server. What are they and how do they function in a LAN. First the WORKSTATION, well it one can also be called the client, terminal, node and other term that a person uses to gain access the information stored on a server. Those terms that have been mentioned all describe the function of the computer that a person uses to do his/her work, process job, access data, store’s data from the or to the server. A basic example of this is the LAN in an internet café where. People paid for certain length of time to use the computer on that internet cafe to play network games, do a typing job, read the online version of their favorite news paper, read their emails, chat or talk online with their family or friends. Still other do documents printing, image capture or scanning an image to upload it online via your favorite social site. Look for jobs, watch a favorite movie or video or download all kinds of stuff from the internet or just simply looking for information. All of the things mentioned above and much more cannot be achieve or it cannot be done without using a workstation, client or a terminal. So basically it is a computer that a real person uses to get information or do a job in a LAN or network. Now for the server which located at the other end of the communication line. The server is basically a computer that holds all the information. A person needs to use a client or workstation to access this information located on the server computer. Imagine if in an typical office where there are ten worker that need different types of information and as stated before all this kind of information is located on the server, but they do not have a network. So getting that different type of information will take time because each worker will to take in turns to use the server. But with a network and each ten worker has each own computer to access the server simultaneously as compare to individually using the same computer directly. Then more time is save and more job is done is a short possible time consumed. That is the basic function and role of these two kinds of computer on a LAN or network. Yes they both computer’s but the hardware and software component is very different, the server is the more stronger or powerful one because simply put it, it need s to be because it function require it to accommodate simultaneous job request from the workstation or client computer. It has more memory; larger hard drives faster processor and a bit different set of software installed in it compare a more user friendly software installed on a workstation or client computer. Not all people in a company can used or has access to the server directly, only one or two person is allowed direct access or usage of the server computer, compare to a workstation or client computer where almost all employee in the company can use these type of computer. More on this topic on my next post. Thanks for sharing this great post. Your article is a must read discussion especially for those who are in IT industry. You've shared a very good idea to ponder and shared information that bring importance to technology. I'm grateful I came down your page and acquire those ideas from you. Your article on the topic Computer Network basic includes the information that i was looking for. Your post helps me to understand what [Computer Network really is, and i will surely recommend it to other people. You have a good discussion there. I'm also into networking. I just have a simple comment about your article, I think it would be better if you site some quick tips on setting up a network. A nice article is discussed here. It has enhanced my knowledge. Thanks for sharing a great blog here. 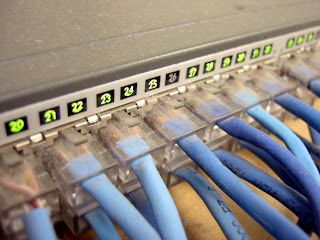 Connecting and configuring a computer network is difficult but with the right expertise, it can be accomplished without much trouble. If you think configuring a network is hard, then you should that troubleshooting and fixing network troubles is even more difficult. Computer networks allow you to share files with friends, family, colleagues and customers that give them more flexible options compared to using RAM or USBs.